This is an ok story, nothing special! Amagi has employed this particular trick and its variations far too many times already and this one wasn't as memorable imo. I gathered The Antlion Trench Murder Case was more of the same, but probably will read it anyway, because it's supposed to have one of the most insanely designed buildings of the entire series. I want to know how that bizarre architecture is used for the plot. 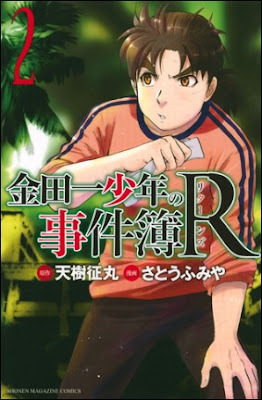 The story certainly doesn't stand out, but man, did I enjoy it as an old-fashioned Kindaichi Shounen story at the time. Sometimes, you just wanna see Hajime solve murders committed on some remote island, but this was the first story of this kind in like four years. The last two stories of the R series (Seiren Island and Fumi's Kidnapping Murder Case) were entertaining too, and obviously not animated as they were created long after the R anime series. Kindaichi is definitely the series of remote islands and isolated locations. You can say about Kindaichi what you want, especially the earlier incarnation, but the series made the isolated location its own from the very beginning. It's more of a series trademark than the impossible crimes, or the alibi-tricks, with the remote island almost being a series mascot. So I can see why a fan of the (early) series would like this one. Hi TomCat, I'm glad you've returned back to Kindaichi, and I confess I enjoyed 'Haunted School Murders' slightly more than you did. If I recall correctly, one aspect of the solution wasn't quite fair-play, and I concede that the motive of the culprit/s felt well-worn and less gripping than when it was used in other similar cases. But I quite enjoyed the central conceit that had a whiff of Yukito Ayatsuji. The Kindaichi Returns Series was of varying quality, but had some interesting entries. 'Fox Fen Fire Murders' was memorable for its emotionally-charged ending, which the anime unfortunately toned down a notch. In terms of the mystery, 'Doll Isle Murders' and 'Siren Isle Murders' were probably the strongest. I'll keep those two titles in mind, but they're not available to me at the moment. Oh well, I can wait.